PASSAIC, N.J. (WABC) -- Authorities have made the biggest bust of synthetic marijuana in New Jersey history. $27 million worth was seized when federal and local police raided a manufacturing warehouse in Passaic. Four men are under arrest, and a large chunk of the synthetic pot industry was taken down. The lab for making K2, which is generally sold to kids, was located just a few hundred yards from a school inside a massive warehouse complex. Police have been warned about the dangerous effects of the drug. Some users have displayed unusual strength and hallucinate. Some take off their clothes. The product produces frightening effects. "Elevated heart rate is a very common symptom," said Passaic County Assistant Prosecutor Michael DeMarco. "The individuals have higher blood pressure, experience nausea, vomiting, muscle spasms, seizures and tremors." Officials are looking at the scope of the operation. As part of the bust, officials found 2,000 packages of synthetic marijuana, 234 small bottles of bath salts or synthetic Ecstasy, and over 32,000 illegally made male enhancement pills. 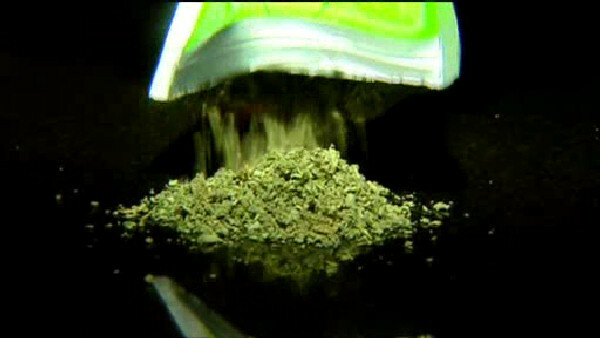 Synthetic marijuana is not the real thing. It is made from plant leaves, including tea leaves and then a combination of illegal chemicals are used to make the drug. K2 is sold in packaging which may be attractive to kids. "Some of the packages include Scooby snacks, there's Hello Kitty packaging that you'll find, there's Angry Bird packaging," said Passaic County Prosecutor Camelia Valdes. Eyewitness News conducted an undercover operation at several bodegas in the Bronx this past summer to try to purchase the product in one of the corner stores. Authorities say users usually find K2 in bodegas, online and in smoke shops. "We know that synthetic marijuana, unlike regular marijuana, is more dangerous and is becoming more prevalent." Authorities say the Passaic production facility may have supplied drugs throughout the nation, but many past busts have revealed overseas connections.